Toronto has a good number of loft buildings. Majority of them are located downtown, between Dundas and Lake Ontario, and in the south-west part of Toronto. But new conversions and new soft lofts are being added all the time, and when it is a new construction (soft loft) the location is not restricted to the old industrial areas. When it comes to lofts, the character of the space, its atmosphere and original industrial details are extremely important. Exposed brick, polished concrete floors, industrial quality windows and doors, wood or concrete beams and tall ceilings provide an excellent background to large, bold art pieces and modern furniture. For that reason lofts appeal to young, arty people. If you are on a lookout for a loft space to call your own, you can request information to be e-mailed to you as soon as one that meets your criteria becomes available. Please fill in Find Your Loft form, and we will set-up an MLS search for you. Or, if you wish to use our services under buyer's agency to find a loft, you will get access to the password protected part of this website, containing much more information. 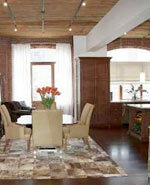 Pet friendly lofts, in the list below, have a little dog image beside the name. Pet-friendliness is being checked and updated, so please make sure to visit again soon for an update. Absolute Lofts 77 Lombard St. Abbey Lofts 384 Sunnyside Ave.
Beach House Lofts 1842 Queen St. E Bloorline Lofts 284 St. Helens Ave.
Boiler Factory Lofts 189 Queen St. E Brewery Lofts 90 Sumach St.
Broadview Lofts 68 Broadview Ave. Brock Lofts 27 Brock Ave.
Button Factory Lofts 200 Clinton Ave. Camden Lofts 29 Camden St.
Charlotte Lofts 36 Charlotte St. Chelsea Lofts 1375 Dupont St.
Chocolate Co. Lofts 955 Queen St. W Corktown Lofts 21 River St.
Church Lofts 111 Robinson St. Columbus Lofts 1 Columbus Ave. Edge Lofts 625 Queen St. E Evening Telegram Lofts 264 Seaton St.
Electra Lofts 1029 King St. W The Euclid Lofts 257 Euclid Ave.
Forest Hill Lofts 1001 Roselawn Ave. Foundry Lofts 940 Lansdowne Ave.
Frederick Lofts 180 Frederick St. Garment Factory Lofts 233 Carlaw Ave.
Glass House Lofts 127 Queen St. E Glebe Lofts 660 Pape Ave.
Gotham Lofts 781 King St. W Gothic Heritage Lofts 32 Gothic Ave.
Hepbourne Hall 110 Hepbourne St. High Park Lofts 437 Roncesvalles Ave.
Imperial Lofts 80 & 90 Sherbourne St.
Knitting Mill Lofts 426 Queen St. E La Piazza 39 Roehampton Ave.
Macdonell Lofts 243 Macdonell Avenue Madison Avenue Lofts 376 MacPherson Ave.
Malthouse Lofts 35 & 39 Old Brewery Lane Manning Lofts 115 Manning Ave.
Massey Harris 915 King St. W Maxus Lofts 80 Cumberland St. Merchandise Lofts 135 & 155 Dalhousie St.
Modern Beach Lofts 952 Kingston Rd. Movie House 394 Euclid Ave.
Mozo 333 Adelaide St. E Mystic Pointe Lofts 200, 250 and 300 Manitoba St.
New York Elan 477 Richmond St. W Noble Court 24 Noble St.
One Six Nine 169 John St. The Oxford Lofts 75 Markham St.
Peanut Factory 306 Sackville St. Portland Lofts 66 Portland St. Printers Row 525 Logan Ave. Printing Factory 201 Carlaw Ave.
Quad Lofts 19 & 23 Brant St. Queen City Vinegar Co. 19 River St.
Robert Watson Lofts 363 Sorauren Ave. Roncesvalles Lofts 433 Roncesvalles Ave.
Seventy5 Condos and Lofts 75 Portland St. Shanly Lofts 41 Shanly St.
Sixty Lofts (1) 60 Bathurst St. Sixty Lofts (2) 60 Niagara St.
Soho Lofts 188 Eglinton Ave. E Sorauren Lofts 347 Sorauren Ave.
St. George Lofts 65 Sheldrake Blvd. St. Johns' Lofts 1 St. Johns Rd. Steam Plant Lofts 10 Wellesley Pl. 20 Stewart Lofts 20 Stewart St.
Stewart Lofts 32 Stewart St. Stonecutter Lofts 43 Britain St.
Twenty 20 Niagara St. Upper Beach Lofts 214 Main St.
Verve Lofts 120 Homewood Ave. Wallace Station Lofts 371 Wallace Ave.
Wrigley Lofts 245 Carlaw Ave. Zen Lofts 42 Camden St.